DUBAI, United Arab Emirates (AP) — A U.S. Navy patrol boat fired warning shots Tuesday near an Iranian vessel that American sailors said came dangerously close to them during a tense encounter in the Persian Gulf, the first such incident to happen under President Donald Trump. Iran’s hard-line Revolutionary Guard later blamed the American ship for provoking the situation. The encounter involving the USS Thunderbolt, a Cyclone-class patrol ship based in Bahrain as part of the U.S. Navy’s 5th Fleet, is the latest confrontation between Iranian vessels and American warships. It comes as Trump already has threatened to renegotiate the nuclear deal struck by his predecessor and after his administration previously put Iran “on notice” over its ballistic missile tests. The Thunderbolt was taking part in an exercise with American and other coalition vessels in international waters when the Iranian patrol boat approached it, 5th Fleet spokesman Lt. Ian McConnaughey said. The Iranian ship did not respond to radio calls, flares and horn blasts as it came within 150 yards (137 meters) of the Thunderbolt, forcing the U.S. sailors aboard to fire the warning shots, McConnaughey said. 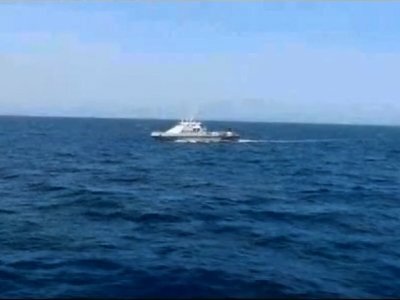 “After the warning shots were fired, the Iranian vessel halted its unsafe approach,” the lieutenant said in a statement, adding that the Iranian vessel created “a risk for collision.” Large ships can’t stop immediately on the water, meaning getting close to each other risks a collision. Video released by the Navy included a sailor giving a position off the eastern coast of Kuwait as the Iranian vessel sat directly in front of an American warship’s bow. Another video included images of the Iranian ship off the Thunderbolt as its horn blared. The sound of machine gun fire followed. Iran and the U.S. frequently have tense naval encounters in the Persian Gulf, nearly all involving the Revolutionary Guard, a separate force from Iran’s military that answers only to the country’s supreme leader. The last one to involve warning shots happened in January near the end of then-President Barack Obama’s term, when the USS Mahan fired shots toward Iranian fast attack boats as they neared the destroyer in the Strait of Hormuz. The U.S. Navy recorded 35 instances of what it describes as “unsafe and/or unprofessional” interactions with Iranians forces in 2016, compared to 23 in 2015. Some analysts believe the incidents at sea are meant in part to squeeze moderate President Hassan Rouhani’s administration after the 2015 nuclear deal, like hard-liners’ arrests of dual nationals. Of the incidents at sea last year, the worst involved Iranian forces capturing and holding overnight 10 U.S. sailors who strayed into the Islamic Republic’s territorial waters. It became a propaganda coup for Iran’s hard-liners, as Iranian state television repeatedly aired footage of the Americans on their knees, their hands on their heads. Iranian forces view the American presence in the Gulf as a provocation by itself. They in turn have accused the U.S. Navy of unprofessional behavior, especially in the Strait of Hormuz, the mouth of the Persian Gulf through which a third of all oil trade by sea passes. Meanwhile Tuesday, the U.S. House of Representatives passed a sanctions package that imposes mandatory penalties on people involved in Iran’s ballistic missile program and anyone who does business with them. The measure would apply terrorism sanctions to the Revolutionary Guards and enforce an arms embargo. Democrats said the new sanctions on Iran don’t conflict with the Iran nuclear deal. Associated Press writers Amir Vahdat in Tehran, Iran, and Richard Lardner in Washington contributed to this report.